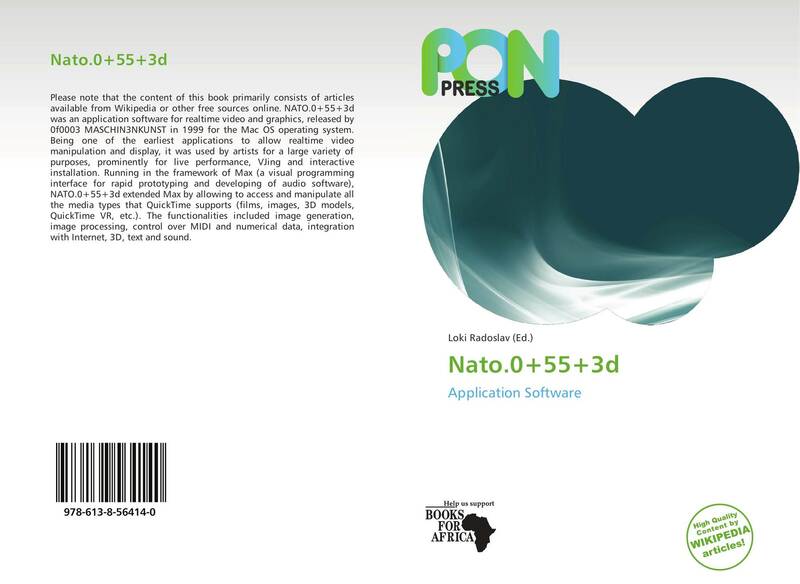 NATO.0+55+3d was an application software for realtime video and graphics, released by 0f0003 MASCHIN3NKUNST in 1999 for the Mac OS operating system. Being one of the earliest applications to allow realtime video manipulation and display, it was used by artists for a large variety of purposes, prominently for live performance, VJing and interactive installation. Running in the framework of Max (a visual programming interface for rapid prototyping and developing of audio software), NATO.0+55+3d extended Max by allowing to access and manipulate all the media types that QuickTime supports (films, images, 3D models, QuickTime VR, etc.). The functionalities included image generation, image processing, control over MIDI and numerical data, integration with Internet, 3D, text and sound.